Western Hickory Click Engineered Hardwood Flooring is sure to warm any room in your home with its rich grain and traditional texture finish. This flooring can be installed on all levels, including basements. Hickory has inherent strength and durability, which make Western Hickory a fantastic flooring choice for your home. Buy online Shaw Western Hickory Saddle 3/8 in. T x 5 in. 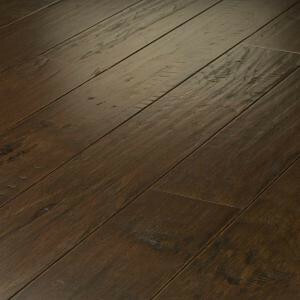 W x Random Length Click Engineered Hardwood Flooring (29.49 sq. ft. / case) DH84000941, leave review and share Your friends.